The humidity and temperature measuring system FMU 4 DATA consists of a humidity and temperature meter, a processing unit and a PC connection. The humidity and temperature measuring system FMU 4 DATA main use is used to measure and monitor climatological conditions in warehouses and on production spots. The temperature and humidity values provided by the humidity and temperature measuring system FMU 4 DATA sensors are continuously transmitted to the PC. Limit values and alarm levels can be established for each measurement site (designating the location of measurement) with the help of the included software. If the climatological conditions fall below the lowest limit or exceed the highest limit, a warning is activated and a flashing signal is displayed on the PC screen. With an additional distribution relay, you can control a siren or something similar. 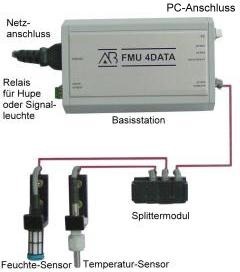 The humidity and temperature measuring system FMU 4 DATA has a mail function that sends alarm signals or messages, for example, to a mobile (e.g. the following message: the humidity and temperature measuring system 14 of the warehouse 4 has activated the alarm.) This way, you will even be informed about disturbances in the warehouse outside working hours, which enables you to take the appropriate steps immediately. The error messages and their corresponding measured values are stored in a logfile and can be saved as a text file to serve as documentation. The basic settings made for the first time in the humidity and temperature measuring system, such as measurement ranges and limit values for the corresponding sensors, will remain stored in the system and can be retrieved and activated after restarting the computer or after a tension failure. 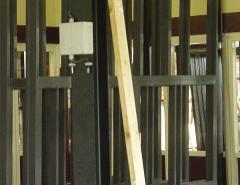 The sensors can be permanently installed in the warehouse and are connected via cable with a distributor. The distributor in turn is hooked to the base station, and the station to the PC with RS-232 interface. 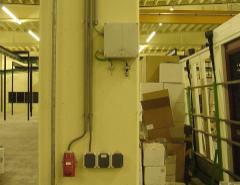 The following images show a mini control network of a warehouse that consists of a base unit and two sensors (for humidity and temperature). The sensors are extremely stable for a long time. Therefore, the maximum deflection of the humidity and temperature measuring system (relative humidity or equivalent weight humidity) is ± 1% in 5 years. You can hook the system up to 99 devices and sensors. The distance to the farthest sensor can be up to 120 m. 100 m distance is considered normal in the standard layout of this type of measurement systems FMU 4 DATA. The software included in the delivery allows total visual control of the temperature sensors and humidity and the temperature meter depending on the position and description. You can control the weather conditions in each room of the warehouse on ongoing basis. You can give names or descriptions and set values for alarm limits. The alarm can be added by a relay output that is in the case of FMU 4 DATA, such as a beep or a light. If you use a dial-up PC, the software can send SMS to your mobile. In addition to this message, there is a visual alarm with a flashing red light on the computer screen indicating that there is an error. The failure indicators and their corresponding measurement values are stored in a logfile and if desired can be saved as a text file to serve as documentation. The software saves the settings you've selected, so when you restart the device they can be reactivated. The software works with Windows versions from Win 98. System Requirements: to use just the humidity and temperature measuring system, you need a PC with basic equipment, you can even use an old PC to save values. The measurement system needs a hard disk of minimum 4 GB to write the logfiles. If you want to use the remote alarm signal by phone via a text message, you need a modern PC with a modem or other means of selection. You will need a good set of pliers to make a good connection between the switch connector and the distributor module. If you do not have any, you can order them. 50 m rolled extension cable to attach more sensors through the SR module. 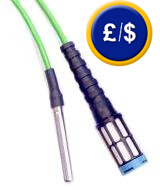 This standard cable can be split and cut to length.